Free Office: ( Windows) includes word processor, spreadsheet, and presentation graphics which contain all the most important features from Microsoft Word, Excel and PowerPoint. The program is malware-free according to VirusTotal and Web of Trust. OpenOffice: ( Windows & Macs) OpenOffice includes programs for word processing, presentations, spreadsheets and graphics, so can be used as an everyday Microsoft Office replacement. It can open and save Microsoft Office formats, and can be used for business, student and home use. LibreOffice 😦 Windows & Macs)LibreOffice is a powerful collection of word processing, spreadsheet, drawing, presentation and mathematics tools. It’s great for professional work – and its interface makes it simple to create professional-looking documents such as brochures, letters and presentations. It is fully compatible with Microsoft Office files, and you can download special extensions and templates to extend its features even further. WPS Office: (Windows, iOS, Android) Fancy editing and creating documents on your iPad or Android tablet? WPS Office is a mobile alternative to Microsoft Office, and it’s free. It includes word processing, presentation and spreadsheet tools, and allows you to open, edit, create and save both Microsoft Office and Google Doc compatible documents. It’s a tiny app size, so doesn’t take up much storage, and includes PDF tools to boot. Google Docs: ( Windows & Macs) Not a full-fledged alternative to Microsoft Office, this free collection of writing, presentation and spreadsheet tools can be accessed from a web browser from any computer, provided you’ve a free Google account. The tools are basic, but it supports the ability to save in Microsoft Office formats. You’ll need to be connected to the internet to use Google Docs, however. iWork: ( Mac only) Not to be left out, Apple includes a series of powerful Microsoft Office alternative tools with every new Mac. They include word processing (Pages), spreadsheet (Numbers) and presentation (Keynote) applications. All can open and save Microsoft Office documents, include a great range of tools for even professional use, and you can open and edit documents on your Mac, iPad and iPhone . FocusWriter is a distraction free word processor: Remember when a word processor was like a computerised typewriter? When the screen was mostly empty, so you could get on with your writing without being continually distracted? And when there was loads of space for your text? PagePlus Starter Edition is a free tool that lets you create dynamic marketing materials like stationary, posters, brochures, flyers, newsletters and business cards, to name a few. With a handy pop-up that lets you pick and choose what you want to create, PagePlus is pretty intuitive for beginners. If you don’t want to start from scratch, or if you need some ideas to get your creativity flowing, the program comes with a good variety of ready-made templates. Even better, PagePlus supports a drag and drop design method, making it a breeze to move around different content quickly during the creation process. Scribus is another one good option. Scribus is a free desktop publishing tool that works cross-platform, which makes it convenient for people who like to hop between multiple computers and operating systems. Scribus offers a lot of great features, such as the ability to export and import PDF documents, as well as drag and drop designs. Formatting can be a little tricky in some instances though, and some scripting knowledge is required to access a few of the features. Formerly known as OpenOffice.org, Apache OpenOffice is another open source alternative to Publisher. Instead of one program to make your creations with, OpenOffice comes with five. You can create content as text documents, using the presentation app, or with the drawing program. For people who like variety, OpenOffice is a really great way to explore how more than one app within an office suite can create customizable content exactly to your specifications. If you want every option known to man and one of the most professional publishing tools available, Adobe InDesign is unquestionably the program to go with. It comes with extensive tutorials and documentation, as well as great integration with other Adobe products. Some great Online Computer Educational Tutorials are available from this website, be sure to check them out. Orato is a text-to-speech tool that can read out loud any text in English. ​still not too late to get a windows 10 upgrade….follow this website. Best Free Windows Applications here. Best Free Software to Make a booklet from Merged PDF files. Free tool to merge your PDF files. New version of Firefox called Firefox Quantum launched on 14th Nov, claiming it to be twice as fast as the current version and use 30% less memory than Chrome. Beta Version here. A security vulnerability has been found in the popular file compression program 7-Zip, update your version now.To check your PC if its a 64 bit or a 32 bit just right click on “This PC” on your desktop and go to properties. There are many LMS platforms with the similar functionality compared with Moodle. Moodle is an awesome, robust and flexible LMS. Do you find that you’re spending too much time on social media when you should be using your PC to work or study? One program that I’ve come across recently is called Cold Turkey. You’ll find it HERE and it’s an 8 MB download. Once installed, you first need to create a site (or list of sites) to block. There’s a built-in list of 24 such sites, which you can use or edit as you wish. You then set a timer to specify how long your access will be blocked for, and that’s it. No access to those sites until the timer’s up. ​What sets Cold Turkey Writer apart from all the other notepad apps out there is that, when you start it up, you’re asked to set a target of a certain number of minutes or a specific number of words. Once you’ve done that, you have no option but to start writing. Because you can’t use anything else on your PC and you can’t quit the program until you hit the target. If you have a collection of DVD movies or music videos and want to extract a chapter or make a full backup copy from a DVD to a video file in the selected format, these are the free DVD rippers you might be looking for. Createfunnylogo.com:Create your own logo or homepage! Wordle.net:generating“word clouds” from the text that you provide. Free Web Headers for your blog or website. Rotate A Video Easily: Held the phone the wrong way while recording? Easy to change it at that website. WinX DVD Author is a great free tool to download, to make DVD without any technical expertise. WinX YouTube Downloader is a software to download both HD and standard YouTube videos. MakeitOne: Free program for joining MP3 files into a single track. Papyrus: A simple way to create your own eBook and share it online. YouTube to MP3 Converter: Enjoy that song on YouTube, but don,t want the video. Easy Click and Copy with Share and Paste into the YouTube to MP3 website. Huge list of free EBooks from the Gizmo folks. Something for every one. Need to Edit a PDF That Can’t Be Edited? Here’s How..The solution is to use a PDF reader that allows editing even when the PDF itself does not. Foxit Readeris free, but be sure to decline the Ask.com toolbar it tries to sneak in during installation. To create one or more digital signs, start by signing up with Oozo at https://app.oozo.tv/register for a free account. Then go to https://oozo.tv/downloads and download the software to install on any spare PC that you have lying around. It needs internet access but doesn’t have to be particularly powerful. Once you’ve installed the software on one or more computers and linked it to your Oozo account, you can start creating content and pushing it out to the remote displays. Everything is done via a web interface, so there’s no need to do anything else on the display machines once they’re up and running with the Oozo software. Filemail’s founders couldn’t find a good way to send large files so they created one. In addition to adding files, it has an add folder function. Directions for sending folders can be found here. If you send very large files, compressing them before sending them cuts down on the transfer time. MailBigFile: Is another website that allows you to send up to 2GB of files for free before you need to pay for it. You do need to register to use MailBigFile but once registered its free to use for transfers up to 2GB. You are also invited to use their business Account for 30 days free. PeaZip is a really nice, free program for Windows that’s a file manager with built-in compression/decompression features. It handles loads of formats and seems pretty powerful. Its main competitor is probably 7Zip, but I reckon that PeaZip looks nicer and is easier to use. it’s a 7 MB download. The site is rated as reputable by Web of Trust, and the software is malware-free according to VirusTotal. If you haven’t got a Kindle, you can still get free Amazon Kindle books, on either your phone, your tablet or your Laptop or computer:. On a tablet. As well as its mobile apps listed above, there are Kindle apps for iPads,Android tablets and Windows tablets. ​Top 100 free ebooks from Amazon. Gizmo collect of free audio & ebooks can be found here. Popular Freebies found in the past 24 hours. KINDLE EREADER: Limited time offer of free ebooks. KINDLE: Free bestsellers ebooks of all genres. Check out more links and information on applications to read ebooks and tons of free ebooks from any electronic item on the Resources page. The Kobo is Kindle’s biggest rival and has a lot more books available to buy (over four million). Kobo’s added bonus is that unlike the Kindle, it can read ePub files, one of the most common file types for e-books. On a smartphone. If you want to try out the Kobo system, there are apps for the iPhone*, all Android mobiles* using OS 1.6 or higher, and for Blackberry*smartphones. On a tablet. Kobo also offers apps for iPads* and Android tablets*, including the iPad, Blackberry Playbook and Android. The app’s tablet version offers all the same features as the mobile version, though you’ll have the added bonus of a bigger screen. On a computer. Kobo also offers a free app for reading on your desktop, for both PCs and Macs. You can download it from Kobo’s site*. Kobo Top Free Books Today. Google Play Book Store, offers books you can transfer straight to your Kobo. Pulp magazines (also called Pulp Fiction) were published from 1896 through the 1950’s. The Pulp Magazine Archive has digitized 11,120 pulp magazines that can be read online and is made available by the Internet Archive, a non-profit library of millions of free books, movies, software, music, websites, and more. There’s a wide variety of titles including Weird Tales, Worlds of IF Science Fiction, True Detective, Witchcraft and Sorcery, Captain Billy’s Whiz Bang, True Story, Adventure, and several more. The free software Calibre is a must for every e-reader owner and it converts file formats to the one supported by your device. More information on ebooks at this website: Money Saving Experts. Do you you love to read? Then join BOOKBUD by submitting your email address and get free bestselling books for Kindle, Nook, and more. ​​On January 6, 2016, The New York Public Library enhanced access to all public domain items in Digital Collections so that everyone has the freedom to enjoy and reuse these materials in almost limitless ways. Whether you need a job application letter, a resume or CV, an award certificate, an invoice, a flyer for your church, a title page for your essay, or just about anything else, you’ll find it here. The templates are all free to download and use, and you’ll find them at http://www.hloom.com. It is really quick and simple to make an animated GIF by combining two or more images into one with a software application or online service, such as those recommended in this article Best Free Animated GIF Maker. Or rather, it is even quicker to get one from tons of readily made animated GIFs from Giphy. It puts almost countless GIFs in a huge database for you to explore at your fingertips. Greenshot is a light-weight screenshot software tool for Windows with the following key features. Easily annotate, highlight or obfuscate parts of the screenshot. Exports the screenshot in various ways: save to file, send to printer, copy to clipboard, attach to e-mail, send Office programs or upload to photo sites like Flickr or Picasa, and others. ShareX lets you capture all or part of the screen, and you can even capture non-rectangular areas too. Plus, there are dozens of additional options such as being able to apply OCR to text in an image and upload captured images to various picture-sharing sites. If you often find yourself needing to grab and save images, perhaps as part of a web-based research exercise, then this program will save you loads of time. ShareX is free, and is a 5 MB download from the GetDShareX website. The file is malware-free according to VirusTotal, and the download site is rated as reputable by Web of Trust. Easy Screen OCR, If you see an image of a page from a newspaper and you want to extract the text. The program is called Easy Screen OCR. It’s a 7 MB download. The file is malware-free according to VirusTotal, and the download site is rated as reputable by Web of Trust. These are huge databases that index millions of Web pages, allowing you to search quickly and conveniently for the item you want. You go to the Website, type in a word or phrase and after a couple of seconds, you’ll be presented with a list of links to websites that contain your text. There are loads of search Engines out there-Examples: Google, Yahoo!, Bing & Ask etc. Most search engines also provide free web- based email address’s that are easy to access just by logging into their website. More on those below. EMail, short for electronic mail has become the standard way by which business communicate, overseas friends and family stay in touch and office employees chat to their peers instead of doing any work. For the uninitiated, it may seem like a simple, perhaps even silly, concept, you type a message on one computer and send it to another instead of simply picking up the phone and talking in person. But as anyone who has tried email will tell you, it’s not only a great deal of fun but brings about a whole different mode of communication, as informal and instantaneous as a phone call but will all the benefits of good old-fashioned letter writing. It also lets you do lots of clever stuff, send one message to lots of people, forward a message you received to someone else, attach documents and pictures to a message so that the recipient can open them on their machine, the list goes on. To receive email you need an email address, which as a real address is what the sender adds to their message to direct it to you. An email address always looks something like this. myname@myISPorcompany.com. When you sign up with an ISP ( internet service provider) you’ll automatically be given an email account and asked to choose one or more email addresses. Email accounts like these, which are called POP3(Post Office Protocol 3) accounts, require an email program a piece of software for writing, sending , receiving, storing and managing your mail. Your ISP may provide you with an email program when you sign up. but a good one, called Outlook Express is built into Windows. A new email account may either set itself up for use with Outlook Express automatically or by means of a self-explanatory wizard. TIP: Other free Desktop Email programs are: IncrediMail, and Thunderbird 2. and Sylpheed. Want to configure your favorite Desktop Email program to access GMail? Click Here. .
An alternative to using a POP3 account is to use a Web-based email account from one of the many free online providers such as Google, Yahoo and Hotmail , of all these three, i have found the Google Gmail account the best for storage, junk mail filtering without any pop-up adverts. Tip: If your Irish and rather get a ” yahoo.ie” than a ” yahoo.co.uk ” email address click here. With these accounts, you don’t use an email program, but simply visit the Website of the provider, http://www.yahoo.ie or http://www.hotmail.com, or http:www.googlemail.com enter your username and password, which you’ll be given when you open the account, then send, receive, store and manage your emails online. The advantage of Web-based accounts is that you can easily check your mail on any computer in the world that’s connected to the internet, and you can delete unwanted emails without having to wait for them to download. However, they do have their drawbacks, some have quite bad security records, you can only store a certain amount of mail at any one time, you can’t view your mail without going online, and everything takes longer,especially if you have a slow dial-up connection. The best option is to open a Web-based account Gmail as well as your normal POP3 account. They don’t cost anything and can come in very handy, because you can access them from anywhere if you travel a lot. 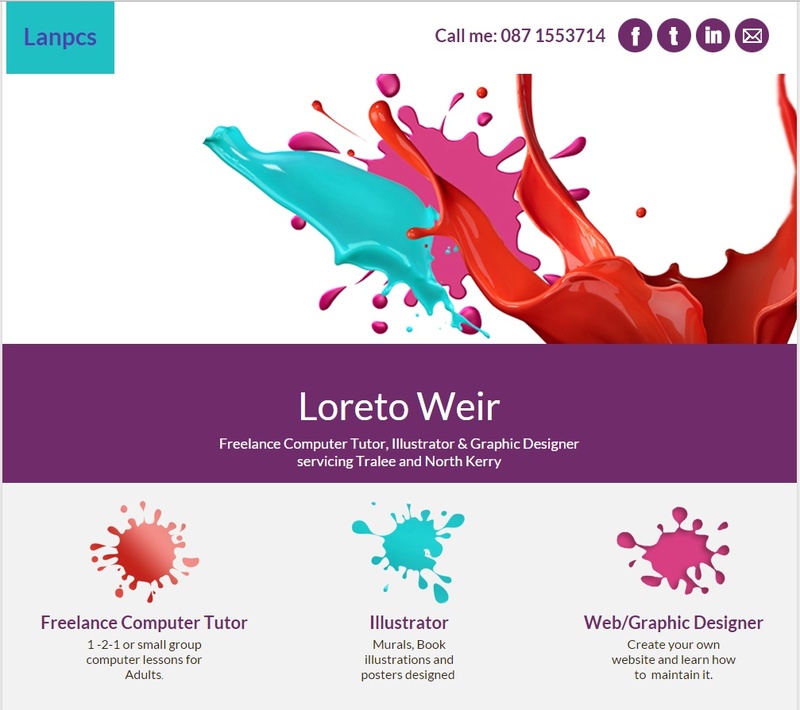 Internet Loreto Weir ( LANPCS) Very nice post. I just stumbled upon your weblog and wished to say that I have truly enjoyed browsing your blog posts. After all I’ll be subscribing to your feed and I hope you write again very soon! I just want to say I am just newbie to blogs and actually loved this web page. More than likely I’m likely to bookmark your site . You certainly have very good writings. Regards for sharing your webpage. Hi there! I know this really is somewhat off topic but I was wondering which weblog platform are you using for this web site? I’m getting fed up of WordPress because I’ve had issues with hackers and I’m looking at alternatives for another platform. I would be great if you could point me in the direction of a good platform. Great – I should definitely say I’m impressed with your website. I had no trouble navigating through all the tabs as well as related info. The site ended up being truly easy to access. Good job..
Glad you enjoy, the twitter link in on the right side panel on the website …. go for a paid option? There are so many choices out there that I’m completely confused .. Any ideas? Cheers!